Operation PUSH was founded by Rev. Jesse Jackson in 1971 to improve the economic status of African Americans in Chicago, Illinois. Prior to founding PUSH, Jackson was head of the Southern Leadership Conference’s Operation Breadbasket in Chicago. Through Breadbasket, Jackson succeeded in persuading many corporations to hire black workers, do business with black-owned service companies, and use black-owned banks. Jackson resigned from his position at Breadbasket in 1971 to establish PUSH (People United to Save Humanity, later changed to People United to Serve Humanity). Intended to be a “civil economics” organization, PUSH’s goals were to increase job security for African-Americans, organize those not making a livable income, and support black-owned businesses. 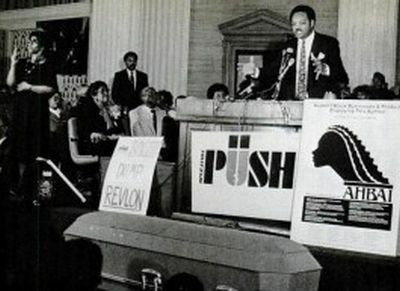 PUSH relied on negotiations and threats of boycott to bring about policy change in several major corporations with large markets in the black community. Coca-Cola, Seven-Up, and Burger King were among the corporations that signed voluntary agreements to hire more blacks, increase business with minorities, donate money to black colleges and organizations, and increase advertising in black publications. As the self-titled “Country Preacher,” Jackson led weekly Saturday morning rallies at the Hyde Park Headquarters of PUSH. The rallies were an important source of Jackson’s influence, and were strategically scheduled for Saturday so he would not be in competition with other ministers. National broadcasting of Jackson’s powerful preaching extended his influence across the country. In addition to PUSH, Jackson initiated a companion project called PUSH-EXCEL, aimed to improve academic standards of inner-city schools, and improve black and minority student performance. Jackson’s high-profile image and controversial character generated criticism for Operation PUSH over the years. The program’s lack of standard accountability in financial matters resulted in several instances of legal difficulties. PUSH has also been criticized for its repeated failure to complete one mission before moving to the next. Jackson’s heavy reliance on the media to draw attention to PUSH’s causes resulted in frequent shifts of focus. Operation PUSH’s influence has varied since 1980. Jackson’s pursuit of the presidency in the 1980s directed his attention away from PUSH, resulting in its decline. Jackson directed his efforts back to PUSH in the mid-1990s though when he oversaw the merger of PUSH and the National Rainbow Coalition, a political organization he founded a decade earlier. The Rainbow/PUSH Coalition initiated a return to PUSH’s traditional economic focus with “The Wall Street Project,” a proposal that promotes minority hiring and inner-city investment among top financial firms and Fortune 500 companies. Ernest R. House, Jesse Jackson and the Politics of Charisma: The Rise and Fall of the PUSH/Excel Program (Boulder: Westview Press, 1988); James Ralph, Operation PUSH Encyclopedia of Chicago http://www.encyclopedia.chicagohistory.org/pages/934.html.